The Matrix Effect (1999–2003) efficiently reproduces the crawling green Matrix consoles in the film 'The Matrix'. This screensaver was popular after the release of the first Matrix film, attracting more than 1.2 million downloads, being particularly popular in Asia. Server-friendly and desktop-friendly, with control over processor usage. Can be used where processor time is valuable. 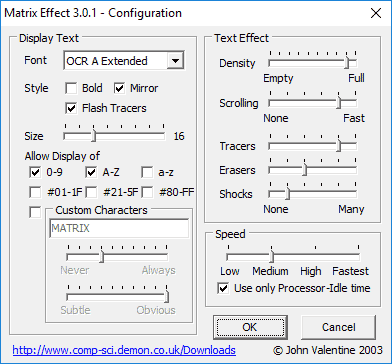 Select any installed font, and choose characters to use in the Matrix code. Control behaviour of tracers, erasers, and scrolling. Add sumliminal messages into the Matrix code. The Matrix Effect is provided for free download and use. If you like it, or have suggestions for future development, please use the feedback form. 14 Mar 2003 Release 3.02 Bug fix: allows XP users to quit the screen saver. 30 Oct 2002 Release 3 Compatible with Windows 2000 and Windows XP. This version uses the 'Easy Screensaver Component for Delphi, (©1999 Jon Baker)' code to handle screen-saver messages from Windows in a standard way. 04 Feb 2000 Release 1 The first release for Windows 95 and 98.